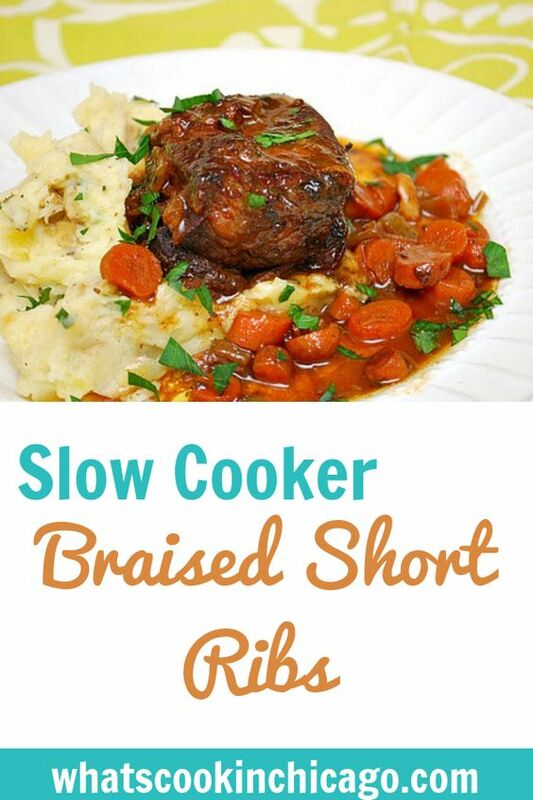 Normally for a recipe like this, I would use my slow cooker/crockpot. But considering I had some time on the weekend to make this in the oven, I went that route, as written below. If you prefer the ease of a crockpot, follow the directions below but transfer everything into a slow cooker. Cook on low for 6-8 hours or on high for 4-6 hours. We loved this over mashed potaoes but it works well with polenta or rice too! Adjust an oven rack to the lower-middle position and preheat oven to 450 degrees. Arrange the short ribs bone-side down in a single layer in a large pan; season with salt and pepper to taste. Roast until the meat begins to brown, about 45 minutes. Drain off all the liquid and fat with a bulb baster and discard. Return the pan to the oven and continue to cook until the meat is well browned, 15 to 20 minutes longer. Transfer the ribs to a large plate; set aside. Drain off the fat to a small bowl and reserve (remember that the handle is hot!). Reduce the oven temperature to 300 degrees. Place the pan on stovetop set at medium heat. Add the wine and bring to a simmer, scraping up the browned bits on the pan bottom with a wooden spoon. Set the pan with the wine aside. Heat 1 tablespoon of the reserved fat in a large Dutch oven over medium-high heat. Add the onions, carrots and celery. Saute, stirring occasionally, until the vegetables soften, about 12 minutes. Add the garlic and cook until fragrant, about 30 seconds. Stir in the flour until combined. Stir in the wine from the pan, the chicken broth, tomatoes, rosemary, thyme, bay leaves, tomato paste and salt and pepper to taste. 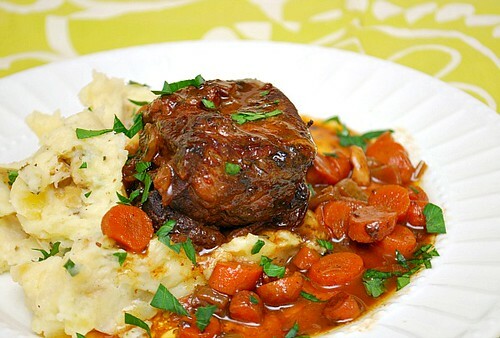 Bring to a boil and add the short ribs, completely submerging the meat in the liquid. Cover the pot, place it in the 300 degree oven and simmer until the ribs are tender, about 2 hours. Transfer the pot to a wire rack and cool, partially covered, until warm, about 2 hours. Transfer the ribs from the pot to a large plate or container, removing the excess vegetables that may cling to the meat. Discard any loose bones that have fallen away from the meat. Strain the braising liquid into a medium bowl, pressing out the liquid from the solids; discard the solids. Cover the ribs and liquid separately and refrigerate overnight. The next day, spoon off and discard the solidified fat from the reserved braising liquid. Add the defatted liquid to the Dutch oven and bring to a simmer, stirring occasionally. Adjust the seasoning with salt and pepper to taste. Submerge the ribs in the liquid and return to a simmer. Reduce the heat to medium and cook, partially covered, until the ribs are heated through and the onions and parsnips are tender, about 5 minutes longer. Stir in the bacon. Serve hot. 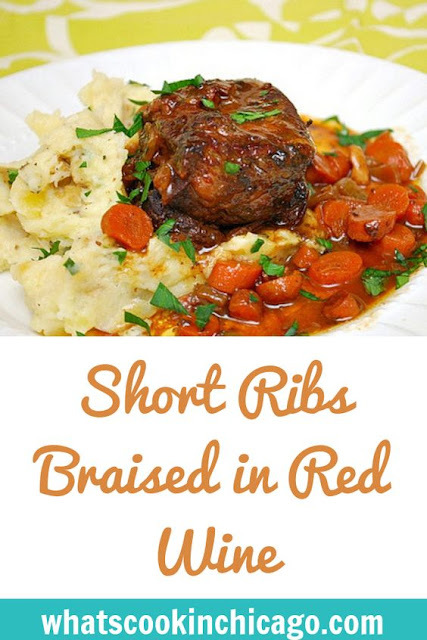 Goes great with mashed potatoes!